(Dec. 29, 1944) - Pvt. Arthur Leithauser, 34, of Ridge Road, Nutley, has been listed among those killed in action in France, according to official War Department telegrams. Mrs. Leithauser, the former Madeline Witck of Belleville, received word two weeks ago today that her husband had been killed Nov. 2. Several weeks previous she had received a telegram that he was missing. Leithauser, an assistant auditor with Globe Indemnity Insurance company of New York City, was drafted Jan. 28, and was home on his only furlough in June. He then went to Camp Meade, Md., and Camp Patrick Henry, Va., where his wife journeyed in an unsuccessful attempt to see him before he went overseas with an infantry unit. He arrived in France ten days before the date he is said to have been killed. Besides his wife, he leaves a two-year-old son Arthur, Jr. and his mother Mrs. Ella Leithauser, of Belleville. The family moved to town 14 years ago from East Orange. 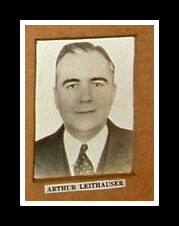 I would like to respond to the article that I just located on the Google search engine.........."Belleville Sons World War II Arthur Leithauser"
It was with amazement that this should appear.......I was NOT looking for this and never realized it was available......thank you, thank you, thank you! This was an article about my husband's father, whom he really never knew because of his untimely death in the war. Do you know if there is any place at all that he may find more information on his dad, Arthur Leithauser. His mom has passed away several years ago and I know he has a great deal of unanswered questions about his dad's life. Any information would be GREATLY appreciated! Thanks again for this possibility!